I get strange obsessions (meaning I buy things looking alike. I'll get back to this later on). 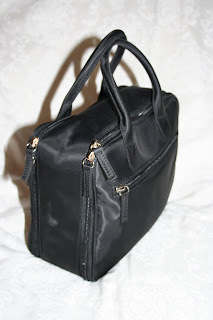 Lately I have been looking for the perfect bag for my makeup (and, when travelling, shampoo, hairbrush, toothbrush, etc). I have seen several that was tempting, some expensiver than others. In the end, as a birthday gift to myself, I invested in this one. Many small pockets inside (some of which can be removed and brought along separately), black, etc. Not exactly what I wanted (I wanted one that could hang on the wall from a built-in hook) but close enough to perfect for my needs. Then, today, I entered a shop.. and saw this. Almost exactly the same, including the removable zippered pockets inside. But it is in black pvc with cute skulls! 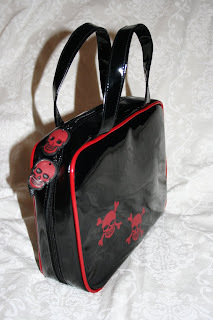 <3 It is lined with black satin with red skull print. Really cute. There was more bags in the same series but I managed to only get this one. If I want to look gothy I can even use it as a handbag!! But did I need it? Probably not. I mean, it is the same thing basically. Though at like.. a third of the price. Which I used to justify the buy, of course. Not that big an expense anyway. Last winter I really liked that deep torquoise colour often called "petrol" (and I also liked cerise). Luckily I snapped out of this before getting more than a petrol sleeveless top and a soft boucle sweater (and one cerise top which I rarely use). I still really like the colour but it is sortof.. bright. And it wouldn't do to have an entire wardrobe in that colour. I know I misspelled turquoise, I saw it immediately after posting, but I keep getting weird error messages when I try to edit the post. So live with it! you would love my white top with tiny black spots...! I have the same kind of obsession as well. And I got a skirt with those dots on last summer as well.